AFTER weeks of deliberation, the Adipec Awards Regional Select Jury (RSJ), has shortlisted 18 entries across six categories as nominees for this year’s edition of the Adipec Awards. From these, the Adipec Awards winners and runners-up will be announced at the Adipec Awards Dinner, which takes place at the Emirates Palace in Abu Dhabi on November 10. Launched to recognise and celebrate energy innovation in the Middle East and North Africa (Mena) Region, the Adipec Awards are presented to deserving organisations and individuals selected on the basis of a meticulous three-tier evaluation process. This year’s award categories have expanded to include two new elements – the ‘Empowerment of Women in Gas and Oil Industry’ award, which aims to recognise initiatives taken to raise the profile of female gas and oil professionals, and the ‘Young Adipec Engineer’ award, which celebrates individuals who have less than four years of industry experience and have displayed great potential as future leaders. Mohammed A Sahoo Al Suwaidi, director, Gas Directorate – Adnoc and chairman – Adipec 2013 Conference, says: “The role of these awards is not just to recognise but to inspire corporations, organisations and most of all people – encouraging them to continue to make a difference in their chosen field of energy expertise. The awards received a record 292 submissions from 22 countries this year, featuring participation from 79 organisations from across the region. The two new categories received more than 60 submissions between them, indicating the increased level importance being placed on the role of women and young professionals within the industry. Nominees were shortlisted after an initial assessment by a Pipeline Review Committee and a RSJ comprising experts from the regional oil and gas industry. Each shortlisted entry will then be thoroughly screened by a minimum of seven judges at the next RSJ meeting. • In the first category, for Best Gas and Oil Project, the finalists are Petroleum Development Oman (PDO), BP Rumaila Oilfield, and Gasco joint project with Adma-Opco and Adas. • The second category, Best Gas & Oil Innovation or Technology, includes Adma-Opco, BP Rumaila Oilfield and Kuwait Oil Company. • The third category of Best Gas and Oil HSE Initiative has shortlisted Schlumberger, Qatar Shell and Takreer. • The fourth category of Best CSR Initiative has shortlisted Total Abu Al Bukhoosh, ExxonMobil and Adnoc Distribution. • The fifth category for Empowerment of Women in Gas and Oil Industry recognised initiatives submitted by Petroleum Development Oman (PDO), Total Abu Al Bukhoosh and Adco. • Finally, the Young Adipec Engineer Award finalists include candidates from Shell Qatar, Shell Iraq and Gasco. The category for ‘Empowerment of Women in the Gas and Oil Industry’ seeks to highlight companies that recognise the value of diversity and are committed to strengthening women’s participation in the sector, particularly in leadership roles. Candidate companies looking to compete in this category would need to demonstrate efforts in exploring challenges and implementing changes to drive women’s integration into the gas and oil industry. The Young Adipec Engineer award comes as part of Adipec’s efforts to nurture future leaders and innovators in the gas and oil sector. Open to individuals who hold less than four years of experience in the industry, the award will recognise the potential of individuals to serve as successful team leaders. The evaluation will scrutinise the aspirant’s scope of work and ability to adapt to the environment, people and situations. Proven leadership qualities and mentor’s recommendations will also be taken into consideration. Serving as Adipec’s jury member for the first time, Sara Akbar, CEO of Kuwait Energy Co, is one of five women on the panel. She says: “The institution of this category is highly relevant. Women’s participation in the sector is a subject close to my heart and I have invested considerable time and effort to encourage this trend. Currently, the example of my career is an exception and not the norm for women in the oil and gas industry in the Mena region. This year’s edition of the Adipec Awards continued to receive submissions in unprecedented numbers from across the region and internationally, including Iraq, Saudi Arabia, and Kuwait, as well as the UAE, Qatar, Oman and Bahrain. Moreso, under the categories of Best Gas and Oil Project, Best Gas and Oil Innovation or Technology, Best Gas and Oil HSE Project and Best CSR Initiative. The judging panel received the entries by September 1, and delivered their independent evaluations by October 1. The panel will now convene for final deliberation and decide the winners of this year’s most coveted energy awards. Adipec’s two new categories have also drawn increased participation. The Empowerment of Women in Gas and Oil category aims to highlight companies that recognise the value of diversity and are committed to strengthening women’s participation in the sector, particularly in leadership roles. The Young Adipec Engineer category is in line with Adipec’s efforts to nurture future leaders and innovators in the gas and oil sector. “The quality of this year’s submissions is phenomenal and firmly places the regional gas and oil industries among the most innovative in the world. We are particularly delighted with the uptake for the new Empowerment of Women in Gas and Oil and the Young Adipec Engineer categories, both of which are integral to the future of the industry. This deadline extension guarantees that those that may otherwise have missed the impending cut-off can now secure their participation in what promises to be one of the most distinguished industry recognitions,” says Al Suwaidi. To support the emphasis on women in the gas and oil industry, this year’s Adipec Awards jury features five female panelists. Chaired by Waleed Al Mokarrab Al Muhairi, chief operating officer of Mubadala Development Company, the jury includes Fatima Obaid Al Jaber, board member and chair of Projects Committee of Al Jaber Group UAE, Aseel Hamoodi, vice-president of Talent and Capability Management at Abu Dhabi Company for Onshore Oil Operations (Adco), Mona Thamer Al Maadeed, manager New Energy at Qatar Petroleum, and Sara Akbar, chief executive officer of Kuwait Energy. “Any award that recognises the hard work of dedicated people in our industry is crucial. The Mena region is one of the key geographical areas for the global gas and oil industry, and it is through awards like Adipec’s that the excellence of companies in the region is highlighted and celebrated,” she adds. Adel Al Jalahma, general manager – Exploration and Petroleum Engineering of Bapco, has joined the regional jury panel for the awards. As a judging member, he will provide his insight of Bahrain’s gas and oil sector to facilitate the evaluation process. The jury comprises key industry experts from regional national oil companies, international oil companies, research and development entities, as well as engineering, procurement and construction departments, academic institutions, and professional associations. The 2012 edition of the awards featured six categories and received 170 entries from 15 countries. The ceremony was attended by more than 750 senior regional industry representatives. After the introduction of the new judging system and 21 newly-appointed regional oil and gas experts to form the official judging panel, the interest for the Adipec Awards rocketed. Fresh categories and a very detailed process of how to write an entry helped candidates to focus their accomplishment in a less than a 1000 word summary, which resulted with a very competitive environment. 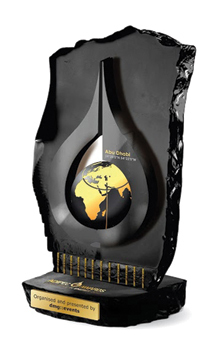 • Best International Oil & Gas Project. Adipec Awards – Excellence in Energy was created to recognise the excellence within individual projects and departments of oil and gas companies in the Mena region, and to support development of a stronger and even more successful oil and gas business community throughout the region. • Attended by 320 senior managers including 70 managers from Adnoc.